- 7.00 pm Finals Yung and Old CADETS on SuperTatami. 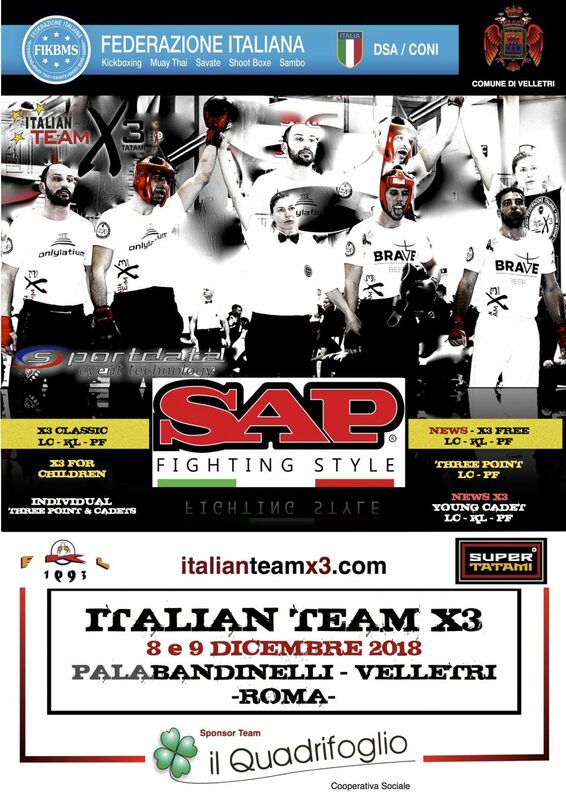 - 6.00 pm: GALA 'EVENING X3 (Finals decided by the organization) on the SuperTatami with Scoring Machine on MegaScreen: LIGHT; KICK LIGHT; POINT FIGHT. X3 CLASSIC - Cadets, Jun. And Sen. Yellow / Green: Team 2 ° and 3 ° Class. Medal. Team First Classified Trophy X3. 1. Unique tournament in the world 2vs2, with the highest jackpot ever registered for Tatami Sport and singular TROPHIES / MEDALS in PlexiGlass. 2. Easy sponsorship by all the teams. 3. SuperTatami - Patented International News. 4. Scoring machine on Mega Screen, for greater involvement of athletes and audience with live commentary. 5. Possibility to make the finals in the evening Gala. 7. Possibility, by the organization and the sponsor, to hire the best teams to Brand a brand. 10. Reduced waiting times and speeding up of meetings.